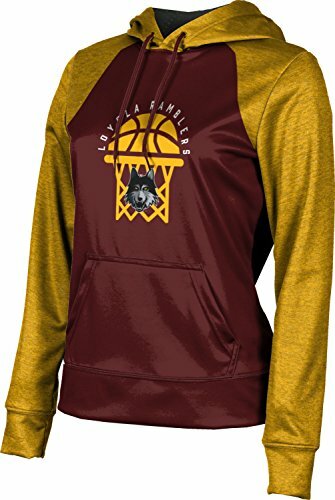 Our Collegiate Licensed Loyola University Chicago Basketball hoodies are made with lightweight, soft brushed premium fleece in a contemporary fit with bold graphics that will never fade. This means that you can show your team pride with our licensed hooded sweatshirt all day for any activity or casual wear. Unlike other brands, ProSphere uses the best printing technology and fabric to sublimate Loyola University Chicago Basketball logo to produce a fully-saturated, superior graphic that will not crack, fade or peel over time - combined with our 100% polyester, this results in a strong and long lasting pullover hoodie with our branded reflective logo. With durability, style and comfort in mind, all our LUC women's fleece sweatshirts offer breathable mesh hood lining, smooth neck tape finish, coverstitch topstitching, color-coordinated drawcords with front kangaroo pockets.